The Beatles changed the world spiritually as well as musically. Their journey to India legitimized meditation in the West, introducing words like mantra, guru and ashram, and opened the floodgates for yogic teachings to spread, within you without you, and across the universe. 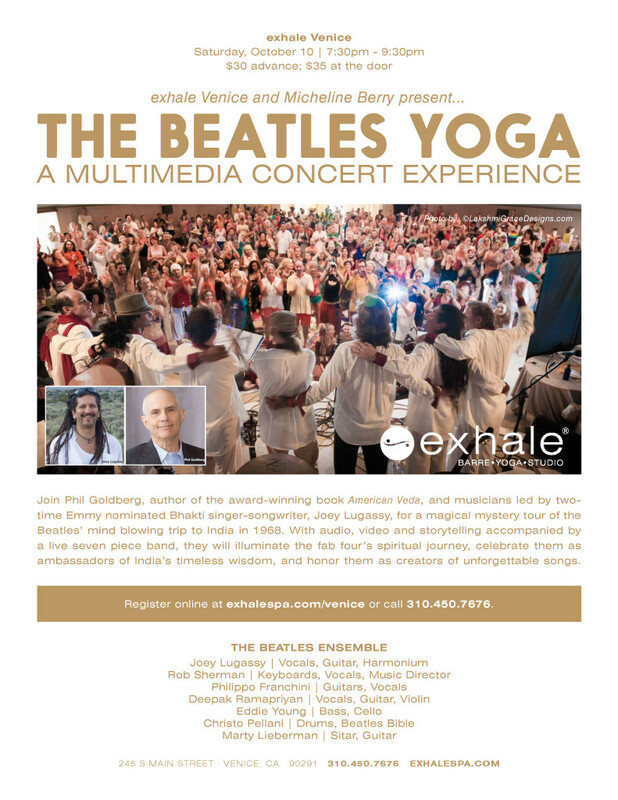 Join Phil Goldberg, author of the award-winning book American Veda, and ace musicians led by 2 time Emmy nominated singer-songwriter and Bhakti rock artist Joey Lugassy, for a magical mystery tour of the Beatles’ mind blowing, world changing trip from the set of “Help” to the banks of the Ganges, to “My Sweet Lord”. With audio, video and storytelling accompanied by a kickin’ 7 piece band, they will illuminate the fab four’s spiritual journey and celebrate them as ambassadors of India’s timeless wisdom and creators of unforgettable songs.